These letters provide a comprehensive work flow system to guide the reader through all the stages of a personal injury claim, from initial instructions through to resolution of the claim. The letters are also designed to deal with many of the practical problems that can arise in the conduct of a personal injury claim taking account of the requirements of the pre-action Protocol, the Civil Procedure Rules and relevant case law. The letters ensure the claim is progressed and issues relating to liability, quantum and general tactics are dealt with effectively whilst keeping the client fully advised throughout. This edition has been extensively revised and updated and takes on board significant changes to the conditional fee regime and the referral fee code, the introduction of predictable costs, the new rules on pre-action admissions and part 36, as well as important new case law. 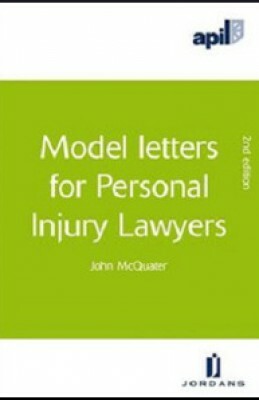 APIL Model Letters for Personal Injury Lawyers also comes complete with a CD-ROM containing all the letters from the book for you to use and adapt to your needs.